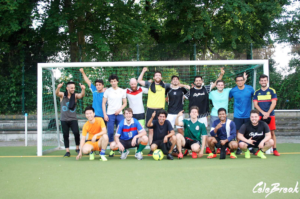 Are you looking to play football in Berlin? At CeleBreak, we make it possible for anyone in the city, from locals to tourists, to play football. In a city as big as Berlin, the opportunities to play football are endless. 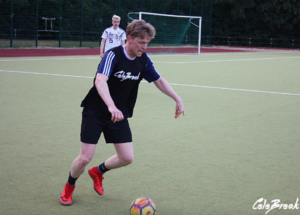 From regular pick-up sessions to competitive leagues, CeleBreak offers the accessible opportunity to play football without commitments to a team’s schedule. Just whenever suits you! We welcome all levels of play at our matches and one of our dedicated organisers will welcome you to our community and play alongside you on the pitch! We arrange the pitch, bibs, balls and create the teams. Therefore, all you need to do is sign up on the CeleBreak app and be at the pitch ready to play! 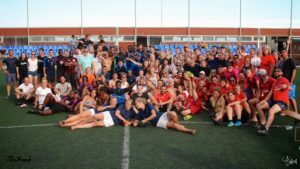 Organising a full game of football is often very challenging for both locals and tourists; it requires finding enough people to play, setting a time when everyone is free, and finding an available pitch. Luckily, at CeleBreak, we take care of all those problems for you. All you have to do is show up and have fun! 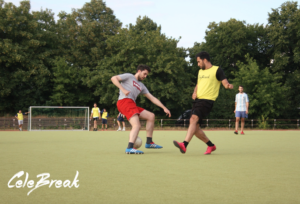 If you are looking to play in a game of stress-free football in Berlin, CeleBreak is the way to go! Signing up to play a football has never been easier! We have created a simple process which comprises of 4 simple steps. Step 1 is to download the CeleBreak app which is available for free on the App Store. Step 2 is to select the game you wish to join, and step 3 is to sign up for the game. Then, the final step is to simply come to the pitch where you will find our organiser and your teammates! First, access our app via the following link: http://onelink.to/fxx2z4 The app will sign you up through your Facebook account to make it more straightforward and less time consuming for you. 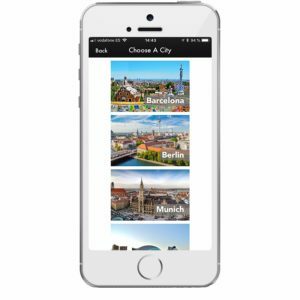 Once downloaded, open the app and you will be directed to the ‘Choose a City’ page where you should select Berlin. Next, the app will display the available pick-up sessions. The location, time of the session and the number of players are visible on this page, making it easier for you to choose a session to suit you. Once you have selected a match, click ‘JOIN GAME.’ Then, you will be directed to pay online. Each game costs 6€ per person which must be paid for through the app prior to your match. In Berlin, we play at 2 different locations. First of all, we play on the Sport Jugendclub pitch in Wedding. The address is Ungarnstraße 65, 13349, Berlin. 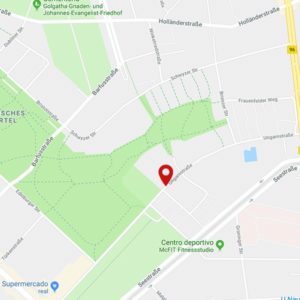 We also play in Neukölln on the NFC Rot-Weiß pitch, located on Pflügerstraße 46, 12045, Berlin. Not only do we offer a unique experience for everyone passionate about football, yet we also photograph and video some of our matches. Then, we publish them on our website and they are visible under the ‘Gallery’ tab. Our dynamic app also makes it easier than ever to sign up for our games. Thus, we are able to help build a lively football community in Berlin. For those looking for even more than the pick-up games, look no further than CeleBreak’s organised league play. These leagues play on a set day every week, allowing you to play with the same teammates every week. Additionally, you have the option to sign up as a team, or individually and we will place you on a team. Thus offering the perfect platform to compete in a league as organised as the Bundesliga, but available to anyone! We can’t wait to see you out on the pitch soon!